In Ivins, Utah, one of TDS’s cable markets, you’ll find a gem of a state park. Located at the edge of the Mojave Desert, Great Basin and Colorado Plateau, Snow Canyon State Park explodes with beauty and photo opportunities. It’s often noted that in any other state, Snow Canyon would probably be a national park. Cut by water, sculpted by wind and time, Snow Canyon State Park’s Navajo sandstone cliffs share the same history and geology as the more well-known Zion National Park which is located about 50 miles to the east. My husband and I recently spent two evenings exploring Snow Canyon. 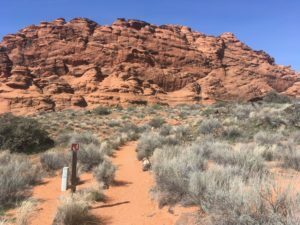 While Snow Canyon is much smaller than the 229-square mile Zion National Park, a frequent hiker in Snow Canyon told me the park is much less crowded and has many of the same rock features of Zion. The park is 7,400 acres tucked amid lava flows and sandstone cliffs of red and white and black lava rock caps. Other geological features include cinder cones, lava tubes, lava flows and sand dunes. 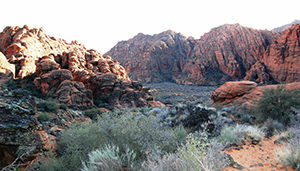 What you won’t find at Snow Canyon is snow as the winters are mild. The park was named after early Mormon settlers Lorenzo and Erastus Snow. You can take many short hikes through the park and see amazing hidden canyons and beautiful overlooks of red and white rock formations. The canyon virtually glows as the sun moves across with different views throughout the morning, day and evening. The park features more than a half mile area of sand dunes. It’s a great sandbox for children to play and our shoes quickly fill up with red sand. The vegetation of the area mainly consists of desert plants such as creosote bush, scrub oak, yucca, cacti and sagebrush. Wildlife includes the Gila monster, peregrine falcon and desert tortoise. You can rent a bike in St. George and bike the seven miles to the park, which includes several miles of bike trails. It’s a good uphill ride to Snow Canyon and my husband informed me that he had an easy coast on his way back to St. George. Johnson Canyon Trail is a two-mile trail into a canyon that winds through lava flows, red rock cliffs to an arch that spans 200 feet. This trail is only open Nov. 15 to March 15 to prevent the disturbance of a large, protected bat population inside the canyon. We had a beautiful pre-sunset hike on an evening with a full moon. Park Ranger recommendation: Hidden Pinyon a 1.5 mile trail with moderate rocky slopes and includes geological features and native plants of the park. It’s a fun hike through a few canyons and beautiful overlooks. The Petrified Dunes Trail takes you through some rugged terrain that consists of the once-flowing mountains of sand. The half-mile trail goes down through the Petrified Dunes and you can hike/crawl up the Navajo red sandstone rocks. The red rocks look slippery, but your shoes grip easily to the rock. Snow Canyon was the site of Hollywood films Butch Cassidy and the Sundance Kid, The Electric Horseman and Jeremiah Johnson. 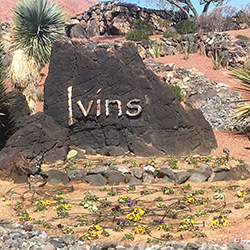 Ivins is a suburb of St. George, Utah. 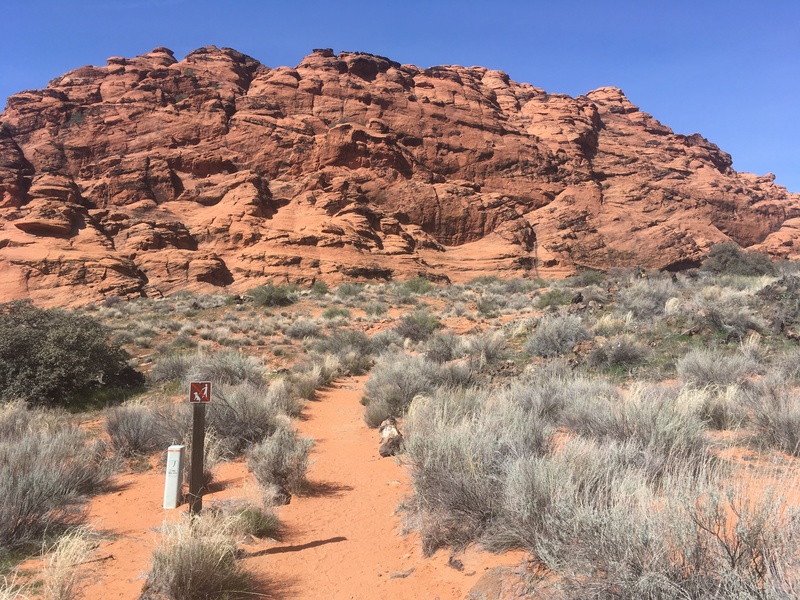 With a population of 7,000, Ivins is near Snow Canyon State Park and the Tuacahn Center for the Arts, which includes a 1,920-seat outdoor amphitheater surrounded by red rocks. Located in Ivins are two world-class spas, the Red Mountain Resort and The Biggest Loser Resort. Thanks Cheryl for the information. We just moved to Saint George from the Sandy Utah area and we found this article something that we can explore in the near future.